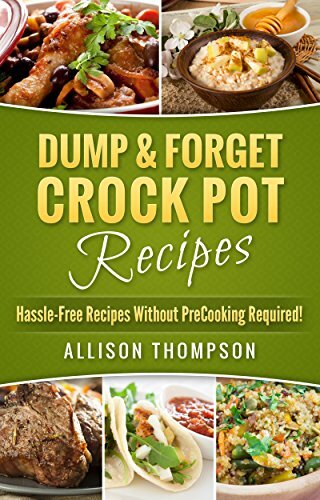 Dump & Forget Crock Pot Recipes - Hassle-Free Recipes Without Precooking Required! Tired of thinking and stressing yourself about what dishes to have each meal? What if you could have at your fingertips, various recipes you can easily prepare by for your meals and deserts? The best part? All you need to do is just dump the ingredients into a crock pot and let it cook for x minutes... and voila, you have the perfect meal your family can enjoy.A healthy meal that retains most of its nutrients, mineral and vitamins as it is cook in its own juices. This is what you'll get from "Dump & Forget Crock Pot Recipes". There are no special skills required which can be easily prepare by novices with no pre-cooking required. 1. Easy-to-prepare recipes that are neatly arranged into breakfast, lunch and dinner recipes with the main course of your choice. 2. Recipes are available for both vegetarians and meat lovers. 3. Fast searching to the recipes of your choice recipe. With this cookbook, you will be able to wake yourself up to a full hearty breakfast and find yourself enjoying mouth-watering lunch and dinner meals at the comfort of your own home. It's Time to enjoy a healthy meal full of nutrients and vitamins. Smile :) and eat to your heart content. Scroll up and Buy Now !